We’ve been living in picture books for the last two weeks. It’s been a place to shore up students’ knowledge of story elements and structure. The lenses have been simple and straightforward. The reading process has been systematic. Parallel structures and themes have been discovered quite organically in the short texts. “Do you think we’ll find this same structure in other stories?” I asked. Of course, there is a huge yes. Students discovered this. They own this one. Today, I grabbed Yard Sale by Eve Bunting and started in. Halfway through the book I realized I forgot to do what I’d been teaching them since day one. I stopped. Immediately hands went up. And “I know’s!” ran out. You forgot to read the back blurb! They chorused. “I can’t believe I forgot that. But the good news is, you knew. Don’t forget to remind me of that. It’s too important. Should I go back and read it now? Yes! Most yelled. Except for one lone NO! Love this guy. Most likely he just didn’t want to stop the story. With one vocal dissenter, we went back and read the blurb. Sure enough, there was a clue as to a possible theme. I used to avoid reading the back blurb because I was afraid I was taking away the magic and discovery of a story. One that the author unfolds and that the reader noodles through. Testing ideas. Going down thinking paths that might be dead ends, rethinking and reevaluating theories. I used to think that reading a book blurb was cheating. The reader is supposed to “earn” comprehension. Work to find it. Reading the back seemed like getting the answers. Kind of like Spark Notes. This year, I’ve come to love book blurbs. 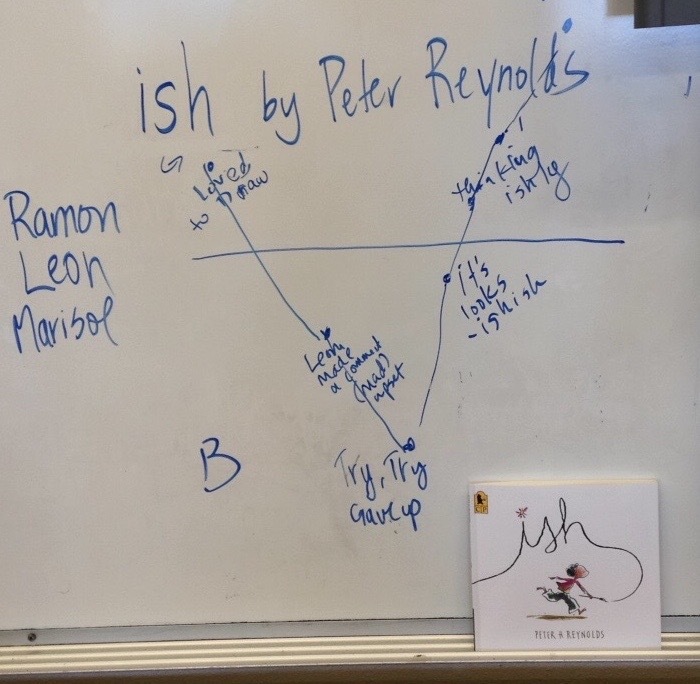 They set up my students up for understanding. The lens is prepared, and we set out, a little ahead of the game, to find out more. Rather than a blank slate, by getting some clues as to the story, we have a rough sketch of an idea as we enter the book. Our goal is to bring depth and nuance to that picture. Reading book blurbs is far from cheating. After all, reading isn’t a multiple choice test. 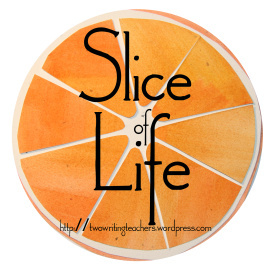 Thanks to Two Writing Teachers for Slice of Life Tuesdays, a place to share our teaching and writing lives. Find more slices here. I used to think the same way too. When I was younger, I systematically read page 11. For me that was a good hint on weather the writer as able to transport me with his story or not. Now I read the back blurb because it’s either written by the author which give you a hint about the style of the book or by the publisher and this me an idea of what kind of audience the books targets. In both situations, I an answer to a very question : do I feel like reading this book ? I like how you wrote about the back blurb setting you up and wetting your appetite for the book. I never thought about the blurb that way. This is so true! I never thought of it like this, and now it makes so much sense. Thanks for the realization. Like our conversations about giving the students a theme up front. Why should reading be a puzzle to figure out. It should be a pleasure to have together. yes–absolutely–reading is not a multiple choice test! the universe must be sending me a message today as this has been the theme of several bits of writing I’ve been reading this morning! Thank you! I am reading a book for a book selection committee and I have checked the back blurb several times as I struggle to get through it. Love “reading isn’t a multiple choice test.” This is true, Julieanne, as is a lot more in your post today. I’ve never thought of specifically using the blurbs to help “start” the reading, but I do always read them myself, always read the intro, sometimes the author’s note at the back. I want to know what she or he thinks about this writing. You’ve described a good conversation! Rethinking book blurbs during read aloud. I read them when I choose books, I teach the kids to read them when they choose their own books, but I have never read them during read aloud. I am glad I get to peek into different classrooms. Thank you for sharing. So true – and I love the organic way these read alouds are bringing your kids into the circle of reading as thinking.